More than 50 people, most of them police officers, were injured in Toulouse during protests against fuel price hikes. Yellow Vest demonstrations turned into riots, making the southern French city and Paris look like battlefields. As France struggles to come to grips with the intensity of widespread protests against increasing fuel prices, which have grown violent over the past weeks, authorities in Toulouse said on Sunday that 57 people, including 48 police officers, had been injured in clashes during Saturday’s riots. Five police officers were hospitalized. Sixteen people were arrested following the disturbances, four of them for “looting two shops in the city center” during the demonstration, a statement said. France’s southwestern city was the scene of unabated violence for hours on Saturday as angry Yellow Vest protesters, who are opposing the French government’s plans to impose new fuel taxes, scuffled with police forces deployed to the area. Photos published on social media showed protesters erecting barricades and burning fires on the streets of Toulouse. Hooded and masked demonstrators were also seen throwing projectiles at police officers, who responded with heavy use of tear gas. Dubbed the Yellow Vest movement, the protests have been occurring weekly since November 17 and get their name from the fluorescent ‘hi-viz’ jackets French motorists are required to keep in their car in case of emergencies. Starting the previous weekend, the rallies evolved and peaked into major clashes between police and protesters, reaching levels of violence unseen for decades in France. Clashes in Paris resulted in more than 130 people being injured –one critically– and in 412 arrests. 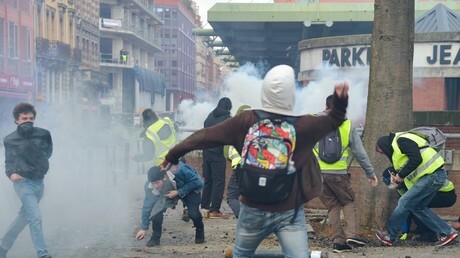 The French government is mulling the imposition of a state of emergency and has vowed to continue with the reforms, though it said it is ready to talk with the demonstrators.